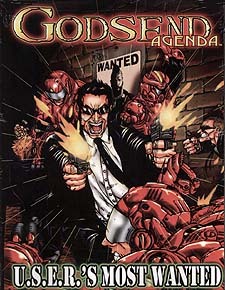 A supplemental sourcebook for the GODSEND Agenda roleplaying game. In 1920, a special Presidential executive order gave approval for a new secret branch of the Department of Health, tasked with assessing the emerging superhuman "problem." Its first agents would be gathered from the brightest and best of the scientific community - and their studies were directed towards stopping the superhuman phenomena, or at the very least, learning to control it. In the year 2010 U.S.E.R. is now not only charged with secretly studying superhumans but neutralizing threats when they emerge. The threat dossier used by the United States Eugenics Research program. Included are over 60 of the worst villains the world has ever seen complete with full write ups. This book is a must have for any player of GM of the GODSEND Agenda.